Biomaterial Industry I Rheolution - Rheolution Inc.
Non-destructive testing of soft biomaterials now possible! Functional and stimuli-responsive hydrogels are increasingly used in biomedical applications. They can be used as scaffolds to fill tissue defects, as cell carriers in tissue engineering and as delivery systems for bioactive molecules. These highly biocompatible materials have mechanical properties comparable to soft tissues in the body. The mechanical degradation (or dissolution) of hydrogels is a crucial factor. For example, in tissue engineering, the biodegradation rate of the hydrogel matrix needs to be tailored to the rate of new tissue formation. i.e. production of ECM and growing cells. Slow degradation rates can eventually reduce the formation of new tissues. When hydrogels are used in drug discovery research, their degradation rates need to be adjusted to microenvironments of the targeted disease tissues, the pharmacokinetics of the bioactive molecules and the desired stimulus-response. Measuring the evolution of mechanical characteristics quantitatively and precisely during the degradation process is crucial for the manufacture of efficient and compatible biomaterials. Since degradation processes change the mechanical properties of hydrogels, it is possible to look at viscoelasticity to measure and assess the degradation process. ElastoSensTM Bio2 is used to characterize the viscoelastic evolution of hydrogels during the formation (gelation) or degradation of the material network and it can monitor the mechanical evolution of hydrogels over time under chemical stimulus. The instrument has a sterilizable and detachable sample holder that can be stored in a controlled environment (e.g. an incubator) to induce and allow for monitoring of long-term physical and biochemical changes. ElastoSensTM Bio2 can non-destructively measure the properties of a hydrogel. 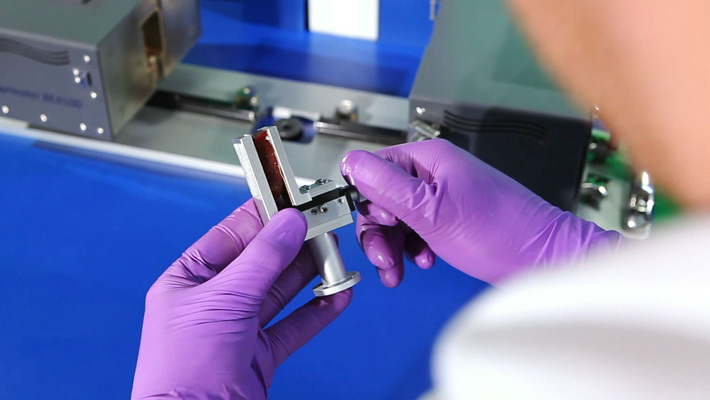 Samples can be mounted in the instrument at any time and as often as desired to periodically perform new mechanical tests. This has the effect of dramatically improving the statistical significance of tests. All these features make ElastoSensTM Bio2 a suitable tool for the design and quality control of biomaterials for drug delivery and tissue regeneration. In the context of Traumatic Brain Injury (TBI), waves induced in brain by blasts (military related trauma) or shocks (sports related or accidental trauma) travel very quickly. The time duration of a shock wave following TBI is only few microseconds and the spectral content of the shock wave is up to, at least, 10,000 Hz. Shear waves following impact travel more slowly than compressional waves and are more attenuated in the high frequency domain. However, considering that shear waves spectrum may reach 1,000 Hz (Chatelin et al., Biorheology 47 (2010) 255–276), it is important to have the proper instrumentation to measure viscoelasticity so as to enable measurement of high frequency response of brain tissues. It is necessary to consider such frequency ranges in cases of blast or shock induced shear waves in the brain. This is critical in the design of efficient protection systems such as helmets. Currently, rheometers, dynamic mechanical analysers (DMA) and indentation systems are used in R&D labs of these helmet development companies. However, these instruments are limited to a frequency range typically below 200 Hz. Frequency dependence of the shear storage modulus of fresh cerebrum and brain stem samples. Rheolution designs, manufactures and commercialises RheoSpectrisTM C500+, the first viscoelastic testing instrument delivering hyper-frequency (up to 2,000 Hz) spectroscopy for soft materials. RheoSpectrisTM C500+ may be used to characterize the complex shear modulus of soft brain tissues over large frequency ranges. In the example given here, the viscoelastic behavior of calf cerebrum cortex and calf brain stem have been characterized from 0 to 1,000 Hz. Both brain parts are strongly frequency-dependent. Indeed, the elasticity of tissues is five to seven times greater at 1,000 Hz compared to its value at 10 Hz. These results are essential to precisely predict how brain tissues react to shearing at high frequencies. This is also a very useful information for engineers that aim to design efficient brain protection systems for military and sportsmen.